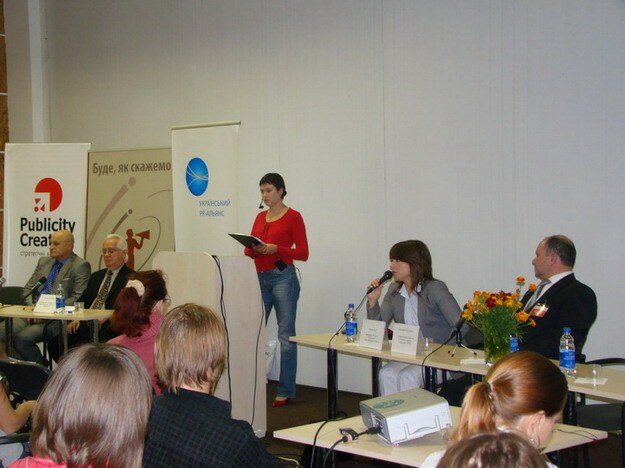 On the 30th of September, 2009, the Fifth PR-forum was held out at the international exhibition of advertising, marketing and media REX 2009. The event was attended by over 300 people due to its traditionally interesting content. The UPRA - the PR-Forum organizer - managed to discuss actual questions, as well as to attract professionals as speakers. The subject of PR-Forum was Ukrainian PR - Passed Tests and New Opportunities. Thus, the audience mainly dealt with issues about PR-market and PR-technologies during emerging from the financial crisis. The forum was full of various activities of such formats. The master-classes, which had practical advice and case studies (including corporate PR, PR events and promotion by social networks), were held out during Forum. For the first time were discussed issues about political technologies and PR. At the round table Pre-election PR-technologies: What's New? participants discussed breaking questions for the pre-election period. Roundtable participants shared their points of views about new trends of current election campaign and PR-technologies that are used. In general, the speakers agreed that the presidential election will be actively involved to the Internet, while methods of influence on voters will become more aggressive. Talk show The Ukrainian PR-market: Lessons of Crisis, was also held out. The discussed issues were: the situation in the PR-market; changes in relations between clients and agencies, new requirements for the PR-agencies; the most demanded services during crisis; forecasts of further development of the market. Also discussed the situation with the professional staff at PR-market, employment opportunities and professional development of young specialists. The talk-show turned into a discussion of Development of PR-market: the New Rules of the Game. Participants discussed the topical issues such as tenders, pricing policy of agencies, PR-outsourcing services. It should be noted that active listener were asking several questions from the conference-hall.